Shopping at LCBO stores is happy yet sometimes pricey. Two days ago I went to LCBO to check if there were any 720ml bottles of Dassai 39 Junmai Daiginjo Sake available in stock. Too bad there weren’t any but a dozen bottles of Dassai 23 Junmai Daiginjo 300ml were on the shelves. I was extremely excited because Dassai 23, the brand’s flagship premium Junmai Daiginjo that rice was milled down to 23% of its original size before fermentation started, were not always available for sale at the LCBO stores, and I immediately decided to buy one. Price for a 300ml bottle of Dassai 23 is CAN$62.55. Not cheap though. But it’s real value for money, in my opinion. I am a fan of Dassai’s Junmai Daiginjo Sake. 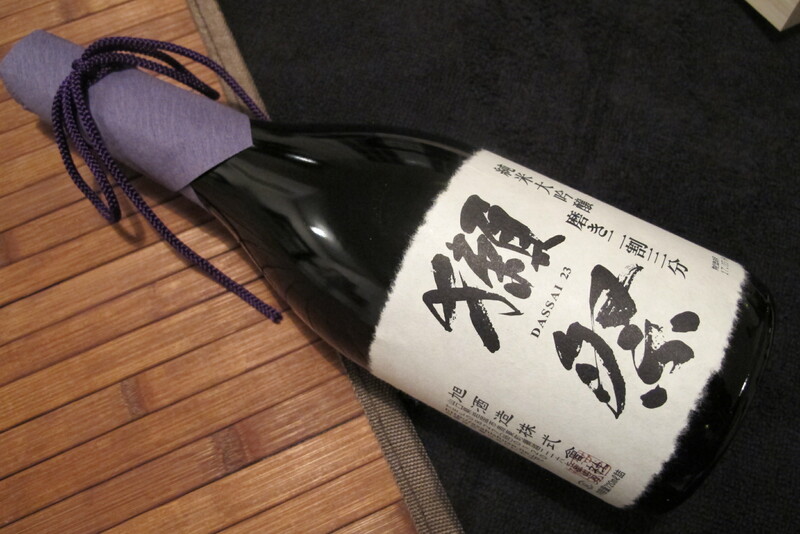 I cannot forget the fruity aroma coming out from the bottle once a Dassai Junmai Daiginjo Sake is opened. I cannot stop thinking about Dassai’s beautiful and elegant flavours which are unique among all Japanese Sake at the same levels. I also miss the long-lasting aftertaste. Asahi Shuzo, the company created the Dassai brand, is a legendary brewery. Established in 1948, Asahi Shuzo is regarded as one young brewery when compared to those having been brewing traditionally in Japan for hundreds of years. Then, what makes Asahi Shuzo an outstanding brewery that their Sake are chosen by Shinzo Abe for State Dinner, and as gifts for head of states such as former US President Barack Obama and current President of Russia Vladimir Putin? I believe it’s because the company has been willing to adopt the cutting edge technology, and had it integrated into the traditional sake brewing environment. For instance, the centrifuge machine used for separating completed sake from the lees – Asahi Shuzo was the first in Japan to use it. Moreover, the 23% rice-milling ratio – Asahi Shuzo was the first brewery to mill down the rice to a minimum of 23% of its original size. In Japan, very few breweries own polishing factories, whereas Asahi Shuzo owns 16 polishing machines at its factory operating 24/7. Asahi is also one of the very first breweries to brew sake year round. The way that Asahi Shuzo has changed in brewing, in addition to the successful marketing strategies, has made major breakthrough to the products. Dassai’s exclusive characters have spoiled numerous drinkers around the globe. Once they have had wonderful tasting experiences with Dassai, they easily get addicted and demand for more. At LCBO’s Highway 7 store, I eventually bought two bottles of Dassai, the famous Dassai 23 Junmai Daiginjo and Dassai 50 Nigori sake. Holding two sake in my hands, I did not want to end my shopping trip; therefore I drove to another LCBO store on Steeles Avenue at Markham Road, which recently has been designated as a new centre for Asian wines. I had a big surprise there! As I was told at the Highway 7 store that all 720ml of Dassai 23 were out of stock, I did not expect to see a couple of them actually available on the shelves. Price for a 720ml bottle was CAN$151.35 compared to the 300ml I bought at $62.55, consumers did not get a better price if they bought a bigger bottle. Having said that, I was happy to find the Dassai 23 packaged in wooden wine box. I brought it to cashier and checked out without hesitation. As August is my birthday month, this is a birthday gift for myself.